After many hours of work the biggest update for this race maps pack is done. 46 new maps a ready to be tested by players of Sauerbraten. Some of you will go through all of them. Some of you stop at half. Some, to my deepest regret, will not pass a single one. But I’m sure that these maps will give you a lot of new emotions. In fact, most of these maps will be difficult to pass. Part of them is an experiment. Some of them are transferred from other games. And other maps better not to show people in Cube 2 at all XD. But like Cooper say “There are some true beauties in it!” so you should try some of them. Despite the reduced quality by YouTube and some my errors in demos “Procursu” as a race movie should be pleasant to watch. Link for maps pack is stored in the description. Just unpack them and play. Maps will be uploaded to the race servers ASAP. on your techno maps you need to do a envmap for every "open space" meaning every area where you can see from the envmap ent to all objects that need to be reflected. What envmap does is makes what is called a cube map for the given area. Then when a object is asking what it needs to reflect it references the cube map to see what to draw. By having one very large cube map you are basically reflecting the wrong things. So to fix this add many more smaller (100-250 radius [first number]) envmaps to the map, allowing each "open area a different cube map. You will have to save and then relaod the map to see the effect. This will make your map look better and reflections will be far more accurate. Thanks for your advice, chasester. But i tried using multiple envmap entities on start of the map creating and find that it work isn't well. The main problem lies in the "reflect map" edges which badly fits with each other. 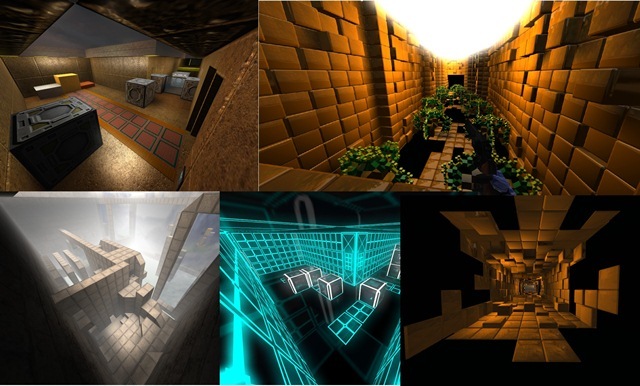 On the map "Orange Cube race" i used multiple envmap ents but for fixing reflect problem i used sky texture.